The Leopard 2 A6 is the most advanced version of the Leopard 2 family battle tanks, developed by the German company Krauss-Maffei Wegmann. The Leopard 2 is equipped with a 120mm stabilized canon and advanced electronics. It can drive and shoot on targets with a a high degree of accuracy. Ammunition like the Kinetic ammunition LKE II DM53 can be used. 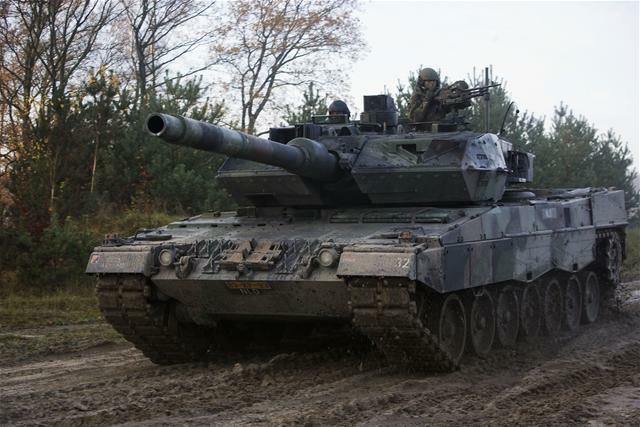 The leopard 2 tank is in use by the armies of: Germany, the Netherlands (until 2011), Switzerland, Sweden, Spain, Norway, Denmark, Australia, Poland, Finland, Greece and Canada. 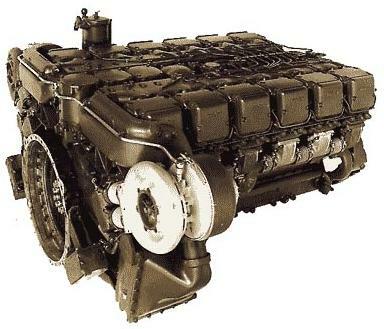 The Leopard 2 has a MTU-MB-873 engine, developed by the German company MTU. This 12 cylinder engine has a maximum power of 1325 kW and a koppel of 2600 rpm. On April 8, 2011, the Dutch Minister of defence told the government that all Leopard tanks will be withdrawn from operational service. This is just one part of the budget cuts of 1 billion euro's. The tanks might be sold to Indonesia but was halted due to protests. On 20 january 2014, the Dutch MoD announced it will sell 100 Leopard 2 A6 tanks to Finland. The Royal Netherlands Army has 65 leopard 2 A6 tanks which are currently kept in storage. The reserve troops had leopard 2 A4 tanks. All leopard 2 A5 in the army are updated to leopard 2 A6. 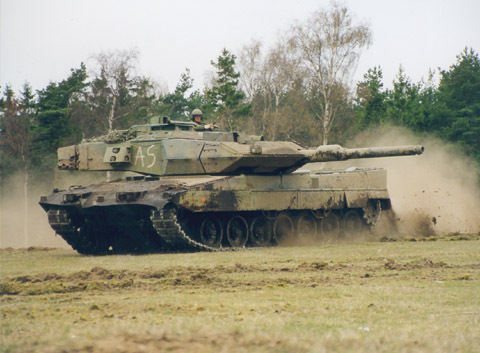 On 11-09-2001, the first Leopard 2 A6 was delivered. Due to the attacks in the United States on this day the ceremonial delivery has been moved. The tanks are divided over 2 mechanism brigades (13e brigade Oirschot and 43e brigade Havelte). After the cold war the number of Dutch tanks shrunk from about 1000 tanks to 100. 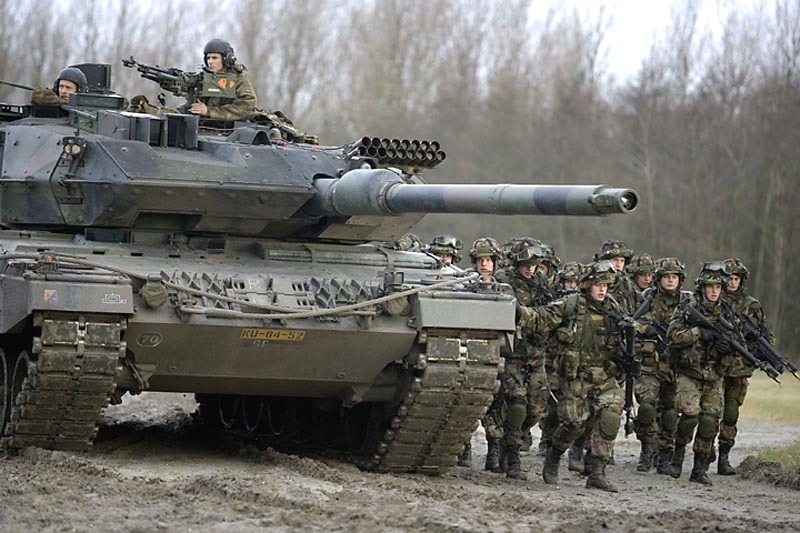 In the Defencenota 2000, the Dutch government decided to reduce 136 leopard 2 tanks. 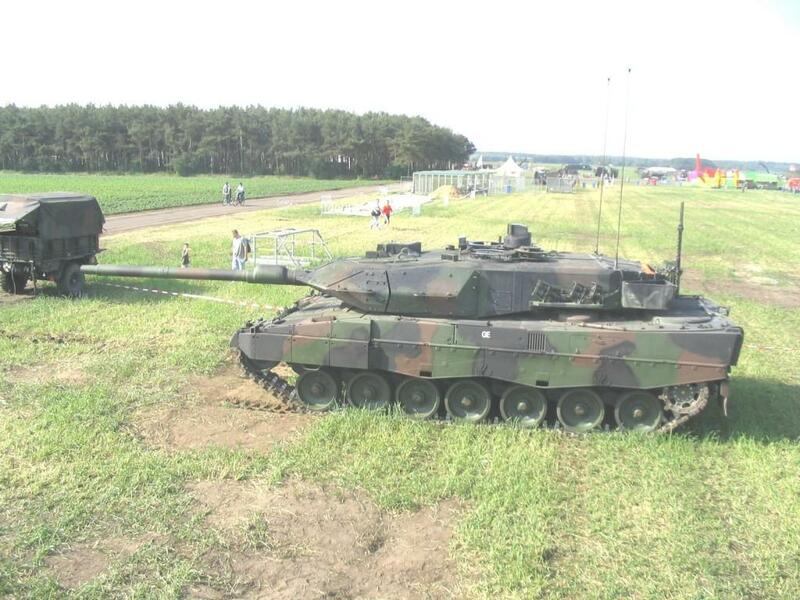 Superfluous Dutch leopard 2 tanks have been sold to Norway and Canada (100 tanks in 2008). 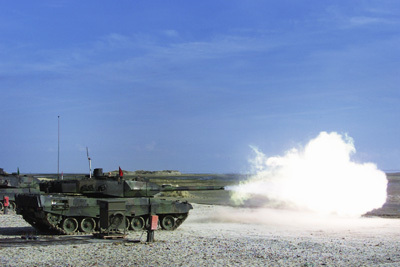 The update to Leopard 2 A6NL contains a 131 cm longer canon tube, new kinetic energy (KE) munitions, an improved ballistic protection, and an improved fire-guided system. A few years after the Canadian defense decided to change from tracked tanks to wheeled armored vehicles, they purchased new tanks due to current operations. At the moment, Canada has leased Leopard 2 tanks for usage in Afghanistan. 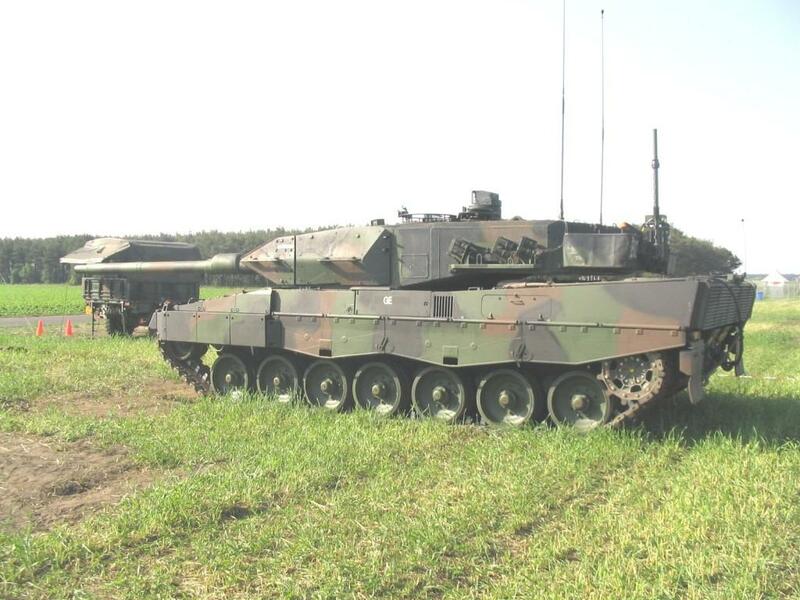 In 2008, Canada announced that it has bought 100 Leopard 2 A6 tanks from the Royal Netherlands Army. 20 tanks will be updated in Germany while the other will be updated in Canada by local industry. On 23 december 1998 the Spanish cabinet agreed to manufacture Spanish Leopard 2E/ER tanks with support of the German industry. SBB a National Company in Spain is responsible for the final assembly, integration, and tests of the tanks. 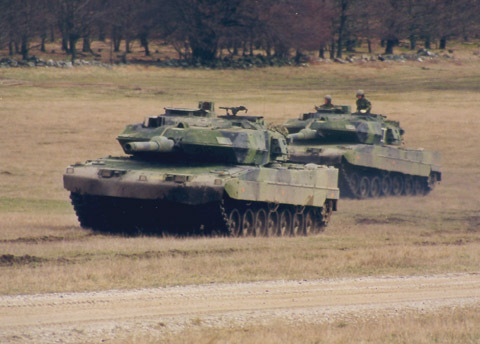 In 1998 Sweden, bought 122 leopard 2 tanks from Germany which are similar with the German leopard 2 A6 but with improved technologies. Sweden designates his tanks with Leopard 2 A6 STRV 122.